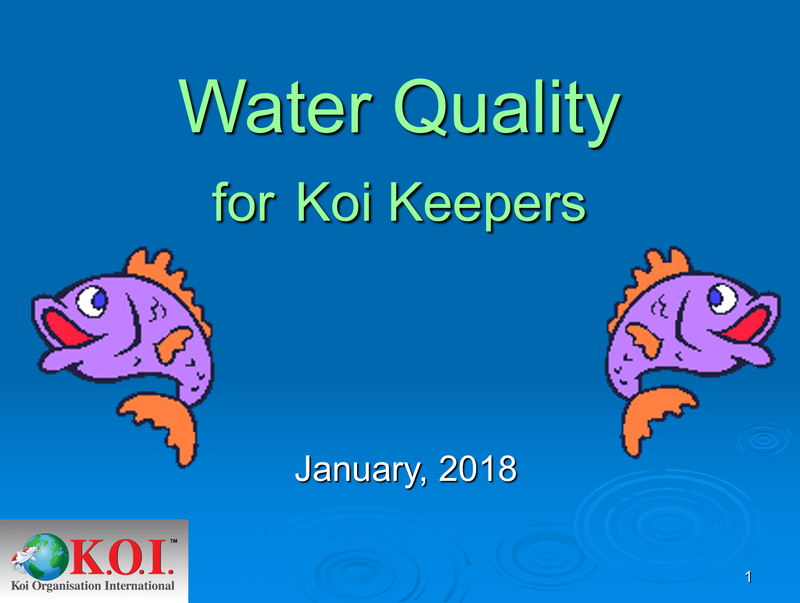 602 Water Quality for Koi Keepers Short Course (Description) | K.O.I. Welcome to one of the K.O.I. Short Courses. Short Courses can be taken entirely on-line, and completed, including test, in less than 2 hours! No interaction with an instructor is required, it is entirely self-paced. 1. Purchase the course through the K.O.I. store by clicking on the Course Sign Up Tab. 2. View the video (Can be found in the My Account area). 3. Take the on-line quiz. That's it! A Certificate of Completion will be emailed upon request. Congratulations! The only work for this course will be a short quiz that should be taken after watching the video. The quiz is on-line, and the link can be found on the video page. When the quiz is completed, any incorrect questions may be re-answered. A Certificate of Completion will be emailed upon request. For questions about the course, please email the original author of the course. In this case, Karen Pattist - pattist@snet.net. After watching the video, take the on-line quiz from the link provided on the video page. Incorrect questions may be re-answered. A score of 80% is required to pass. Upon passing, the student will be emailed a Certificate of Completion. Students have one year from date of purchase of the course to complete the quiz successfully so that they will receive their Certificate of Completion. Students will be given every reasonable opportunity to understand the answers to the quiz and exam questions. The K.O.I. policy in regards to the student code of conduct is clear. Cheating will not be tolerated. Students will be failed if they cheat. Purchase the course through the K.O.I. store by clicking on the Course Sign Up Tab. Download the course instructions/quiz document. Email the quiz to our Student Coordinator (address and instructions in the download document).